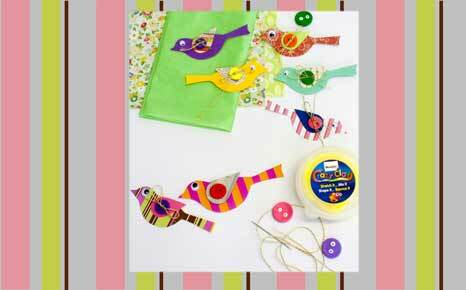 Spread your creative wings and make these beautiful birds to use as gift cards, string together to make a delicate mobile or use to decorate gifts. Recycle, play and decorate in one easy craft! The buttons: Roll Crazy Clay into brightly coloured balls. Squish the balls gently with your thumb to flatten them. Using a toothpick, poke two holes to make them look just like buttons. Set aside to dry. The birds: Print out the bird template provided in the download section below or draw it yourself. Cut out and glue the shapes onto your different paper and do the same for the wings. Then glue your wings onto the bird shapes. When your buttons are dry, us a darning needle and string or thread to sew the buttons onto the bird, poking holes through the paper. The eyes: Grab one of those crazy wiggly eyes from the Bling Bitz wheel and glue onto your bird with Clear Adhesive.